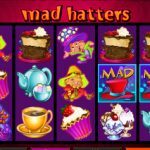 The Mad Hatters have escaped Wonderland and are roaming free across the reels of this Microgaming slot. 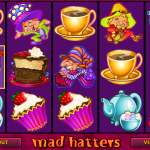 We all know that the Mad Hatter has a thing for tea so it’s no wonder why most of the symbols resemble a tea party. This is a very fun slot with goofy symbols and interesting animations. The game has a rich pay table and a variety of bonus features which can produce nice payouts and are sure to keep you on the reels for hours at a time. The wild symbol in the slot has a great 20.000 coins payout for 5 of a kind wins and will substitute for all of the game symbols except the Cuckoo Bonus symbol and the Bunny Scatter symbol. If the wild lands on reel 3 he will expand to cover the entire reel. If 3, 4 or 5 Cuckoo Bonus symbols land anywhere on the reels the Cuckoo Bonus is triggered. You will need to make picks among Cuckoo Clocks and each one will award a coin prize. You get to pick as many clocks as the number of triggering symbols and the maximum amount you can win in this feature is set at 13.500 coins. The slot also has a free spins bonus which is triggered with 3, 4 or 5 Scattered Bunny symbols on the reels. You will be awarded with 10, 25 or 50 free spins accordingly and all payouts during the feature will be doubled in size. But that’s not all. Before the free spins start you will need to choose one of the top three paying symbols. This symbol will act as an extra wild symbol during the feature. 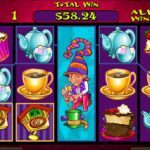 Mad Hatters is a very interesting Microgaming slot simply because it has a lot of bonus features to offer. They make the game play exciting and can award big payouts along the way so care to come for a tea? If you games based on good old legends then consider playing King Arthur a 5 reel slot by MicroGaming.